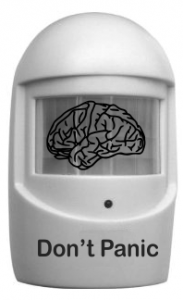 Motion sensors don’t sense changes in motion, they sense changes in heat radiation. Anything not frozen at absolute zero (-273°C or -460°F) emits heat. We humans can’t see heat waves with our eyes because they are far, far below the visible spectrum but to a device that sees infrared wavelengths, the waves radiating from heat are as clear as daylight. In the heart of a motion sensor rests a crystal which generates electricity whenever it “sees” heat emanating from a nearby object. A device near the crystal is calibrated to check for infrared energy between 8 micrometers and 15 micrometers in wavelength which is the wavelength of radiation emitted by us heat oozing humans. Healthy human beings go about their day with internal temperatures hovering around 37°C whereas a comfortable room temperature is 17°C. A good motion sensor has no trouble figuring out a human has walked into a room because there is a temperature difference of 20°C between the room and the human. If we are at home and we walk into a room containing a motion sensor connected to a light switch, the lights will automatically turn on. If we sneak into the Louvre in Paris with the intention of stealing the Mona Lisa then an alarm will trigger. Either way, the radiation from our body heat has been detected. Motion sensors need to be smart when detecting heat changes because sometimes the temperature in a room can change without motion. Empty rooms will warm and cool naturally as day turns to night and night turns to day. We don’t want the lights turning on and off in empty rooms. Software coded into motion sensors ensures this doesn’t happen. At a yoga retreat I once attended the yoga-meditation room had newly installed motion sensing lights. These lights were programmed to turn on when they sensed motion and to turn off when no motion was sensed for ten minutes. The lights did not have a physical on/off switch or an override switch. These particular motion sensors were troublesome because the guided meditations and relaxations were longer than ten minutes. If someone moved during a meditation the lights came on. We as meditators were seeking gentle ambient lighting during our relaxations, not flickering nightclub strobes. Our only recourse was to leave the motion sensing lights off permanently. We shut off power to the lights by flipping a breaker switch. Instead of the motion sensing lights, during the day we used the natural light streaming through the many big windows. During the darkness of early morning meditations we used the soft light from electric lamps. Like the crystals at the core of motion sensors, our brains and our nervous system are at the core of our emotion sensors. Our brains evolved to respond to emotions, both our own and the emotions of others. We’ve got a lot riding on our ability to correctly sense emotions because they are at the heart of human relationships. Sometimes our emotions catch us off guard, seemingly popping out of nowhere, all of a sudden. They may seem to come out of nowhere but what they really are is an outward movement from within our nervous system. The word emotion is short for ex-movement (a motion outward). Emotions are an outward movement of energy from our hearts and minds to our body. The better we are able to sense our nervous system sending an emotion outward, the better we can decide what to do with it. Meditation helps us see emotions hidden from our normal awareness. It helps us sense where the emotions might be radiating from and allow the time and space to choose to express the emotion or to forego it. As our meditation deepens, we develop the ability to steer power away from automatic emotions so we are not at their mercy. As we become experienced meditators, we recognize some emotions don’t require action. We can just leave them be without adding energy or encouragement. Like an empty room warming and cooling throughout the day some emotions are merely the ebbs and flows of our moods as the day turns to night and the night turns to day. We don’t need to do anything about these. We do however want to sense the rise of unhelpful emotions, emotions that deplete our energy and produce nothing good for us. These are emotions that might entrap us into pointless arguments or addictive behaviours. Some unhelpful emotions are burglars that have sneaked into the Louvre of our hearts and the prize they are trying to steal is our peace of mind. We need to trigger an alarm alerting us to respond with focus and tranquillity. We need to make sure we don’t let our minds be hijacked. Meditation brings the clear light of awareness to what is truly going on in our hearts and minds. We are able to consciously chose our emotions, emotions that illuminate and elevate. As mind elevaters we use the lamps of judgement in responding to the darkest of times.